Adaptation – in the world of media, it is the act of altering the written text of a story so that it may be preformed for film, television, or theater. It’s not as easy as just handing the actors a novel and expecting them to be able to preform the story on camera or in front of an audience. It is up to a screenwriter or playwright to take the novel, visualize the story in their head, and then create a script specifically for the medium they intend to use it in. There are two big tasks for the screenwriter to deal with. The first is to create a dialogue because that is the primary way that the actors will be able to communicate the story to the audience. While they may have some help with some dialogue in the original story, the screenwriter must create more conversation to fill in the gaps that one can narrate within the text of the novel but cannot convey on screen or stage. The screenwriter must also map out how the story will visual play out in their adaptation. They must describe the set, the background, the camera angle, the positioning of the actors… every little aspect of the production must be written into the new script or screenplay. When you come down to it, an adaption might have originated from a written novel, but the show really comes from the creativity of the screenwriter. In the world of otaku media, it is not nearly this difficult to adapt between the two biggest mediums we care about – anime and manga. Manga, by nature, is already very visual and entirely dialogue driven. The panels can serve as a “storyboard” of how the anime adaptation will look and the word bubbles can serve as the script for the voice actors to use. And more often than not, many anime adaptions do just that. That is, unless you are director Akiyuki Shinbo and his team at Studio Shaft. In a move of creative genius, this studio brings back the art of adaptation in many of their anime projects. This week, I’d like to go over two such series from the studio that are currently available in America, Tsukuyomi ~ Moon Phase ~ and Pani Poni Dash! Tsukuyomi originally was a manga series created by Keitaro Arima about a cute little vampire and her relationship and adventures with a mortal boy. It became so popular that in the fourth year of the comic’s serialization, the series was picked up to be adapted into an anime by Studio Shaft. With four years worth of storyline already written up to that point, Shinbo and his team could have easily just animated Arima’s story panel-by-panel. But they clearly decided to have a little fun with it instead. While it was always somewhat of a tag line to the comic, Shaft officially appended the English phrase “Moon Phase” to the title their anime adaptation to distinguish it from the manga. Changing the name of a series when creating an anime series happens very rarely in the business, and I feel that in this instance, it was done intentionally to prove a point by the animators. Tsukuyomi was a manga by Keitaro Arima, but Tsukuyomi ~Moon Phase~ was an anime created by Shaft. In their adaptation, Shaft created an underlining symbolic notion that the show was a stage production and the characters where all actors preforming on stage. This metaphor is really brought out in the show’s wacky final episode, but the viewer can sense it starting from early on. A “stage view” camera shot of the family’s home is used frequently through out the series, often in scenes where actions are happening in different rooms at the same time. 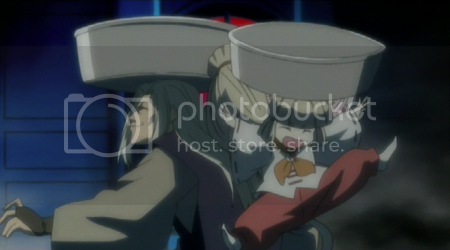 On TV, you would typically animate such scenes by alternating camera shots between both rooms, or perhaps even using a “split screen” to show both characters in the frame at the same time. 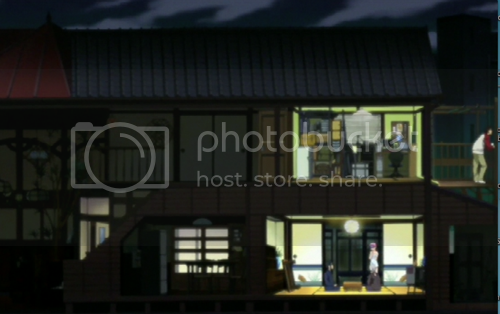 However, Shaft goes with just one static shot of the entire house and keeps it there for a long period of time. Most of the house is unoccupied and not even lit up at that moment. This forces the viewer to focus his or her attention on only a small part of the screen, which is very similar to a viewing experience one has while watching a stage production. Another device that Shaft added to their adaptation is a gag moment in which an empty bath pan falls onto the characters in their moments of stupidity. At first it seems like nothing out of the place, because such a bit is normal in the tsukkomi-boké style of Japanese comedy. But then the viewer realizes that the same odd gag happens in almost every episode, and then in the later episodes of the series, the empty bath pan drops in at very inappropriate moments. The bath pan no longer becomes a gag moment in the show. It’s an example of what control Shinbo and Shaft has over the story in their adaptation of the show. This was their screenplay, their stage production, and they could do whatever they want to the plot and performances. 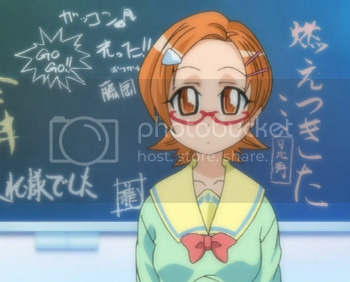 Shaft continued on this stage adaptation motif in 2005 when they created an anime show based on the 4-panel gag manga Pani Poni. 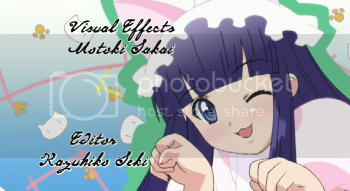 Like with Tsukuyomi, Shaft added an English word to the end of the title to once again show that their Pani Poni Dash! creation was going to be different than it’s source manga. 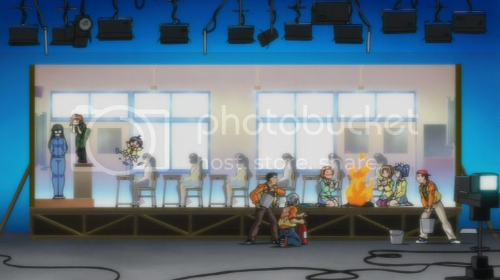 This time around, they turned the show more into a television production instead of a stage production, and made the metaphor much more obvious. The set really turns into a stage at least a couple of time in every episode. At times, you can even see stage lighting on top of the set and a camera crew filming in the foreground. In one exterior shot, you saw the crew creating the weather outside with fake rain and wind. The Pani Poni manga was originally a comedy, so Shaft wasn’t able to impose an “empty bath pan” device like they had previously because it would be lost in all the other running gags in the series. So in lieu of this, they created a new device that would become the most widely known trademark of the studio. At almost every opportunity they get, the staff of Shaft would fill the chalkboard of the classrooms with random phrases, pictures, and tiny bits of commentary. These phrases almost never really fell into the context of the scene, and if the viewer were to focus their attention towards the chalkboard, it would completely take them out of the scene. It’s a major distraction and unconventional, but it was how the studio put their mark on their own production. There’s even a hint of improvisation into their stage productions. In general, the only really “scripted” moments of an anime show are the theme songs, because those remain fairly constant week after week. Sure, their might be some exceptions for the first or last episode of a series, or it might even switch to a new song for each 13-episode “season.” But in general, once you see the theme song for the first time, it’s not going to be any different the next time. Not for Shaft, however, as they often went “off script” for these sequences, thus leaving the audience open for an unique surprise each episode. For Tsukuyomi‘s opening theme song, “Nekomimi Mode”, there are a couple of scenes that would be different each week. The main character might turn into a rice ball one week and then into a backpack the next. 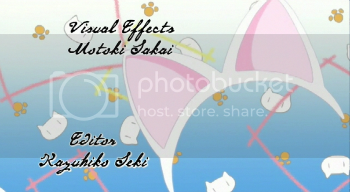 One particular “Nekomimi Mode” sequence ran without the main character in it at all. Her cat ears remained, but her body was removed from each frame, even at the risk of having moments of just nothing on screen. Pani Poni Dash! went through three different opening theme songs, but the switch was never very clear. One week you’d have a new theme song, the next week it would go back to the original, and then the week after that, you’d get the new one again. And several of the five different ending theme songs left themselves open to similar “grab bag” techniques you found in Tsukuyomi. One week it would feature chibi-version’s of the shows character, the next week the chibis would be wearing swimsuits, and the week after that, they’d all be chibi space aliens. Down falls a couple of empty bath pans from the heavens, crashing onto our heroes in the middle of their serious battle. You can currently check out this creative side of Shaft with Moon Phase out on FUNimation DVD, iTunes, and the FUNimation channel. Pani Poni Dash! was released in the US by ADV, but is now under the ownership of FUNimation. I was still able to get the ADV DVDs off of Netflix, but I assume FUNi will re-release the series into their various channels sometime soon. A Shaft / Shinbo adaptation of Ken Akamatsu’s Negima series, entitled Negima? !, is also set to be released by FUNimation in the near future. This entry was posted on Wednesday, September 3rd, 2008 at 6:37 pm by Scott	.